What Does Magnetism Have to Do with Plate Tectonics? What Are the Features of a Subduction Zone? What Is the Role That Each of the Earth's Layers Plays in Plate Tectonics? When you stand on the ground, it seems very hard and stable beneath your feet. Any mountains you see look solid and unchanging. The truth, however, is that the Earth’s landforms have changed and moved many times over millions of years. These landforms reside on what are defined as tectonic plates. The definition of tectonic plates for kids involves thinking of the Earth's crust as large slabs that move over a liquid mantle. Mountains form and earthquakes shake at tectonic plate boundaries, where new landforms rise and fall. What Is the Definition of a Tectonic Plate? To define tectonic plates, it's best to start with a description of the Earth’s components. The Earth has three layers: The crust, the mantle and the core. The crust is the Earth’s surface, where people live. This is the hard surface you walk on every day. It is a thin layer, thinner under the ocean and thicker in spots where there are mountain ranges, like the Himalayas. The crust serves as insulation for the center of the Earth. Just underneath the crust, the mantle is solid. The solid part of the mantle combined with the crust make up what is called the lithosphere, which is rocky. But the further down into the Earth you go, the mantle becomes molten and has very hot rock that can mold and stretch without breaking. That part of the mantle is called the asthenosphere. The best way to define tectonic plates is that they are parts of the lithosphere that break up into huge rock slabs, or crustal plates. There are a few really large plates and several smaller plates. Some of the major plates include the African, Antarctic and North American plates. Tectonic plates basically float on the asthenosphere, or molten mantle. While it is strange to think about, you are in fact floating on these slabs called tectonic plates. And under the mantle, the Earth’s core is very dense. Its outer layer is liquid and the inner layer of the core is solid. This core consists of iron and nickel, and it is extremely hard and dense. The first person to theorize that tectonic plates existed was German geophysicist Alfred Wegener, in 1912. He noticed that the shapes of western Africa and eastern South America looked as though they could fit together like a puzzle. Displaying a globe that shows these two continents and how they fit is a great way to demonstrate plate tectonics for kids. Wegener thought that the continents must once have been joined together, and somehow moved apart over many millions of years. He named this supercontinent Pangaea, and he called the idea of the continents moving “continental drift.” Wegener went on to discover that paleontologists had found matching fossil records in both South America and Africa. This bolstered his theory. Other fossils were found matching up the coasts of Madagascar and India, as well as Europe and North America. The kinds of plants and animals found could not have traveled across huge oceans. Some fossil examples include a land reptile, Cynognathus, in South Africa and South America, as well as a plant, Glossopteris, in Antarctica, India and Australia. Another clue was evidence of ancient glaciers in the rocks in India, Africa, Australia and South America. In fact, scientists called paleoclimatologists now know these striated rocks proved that glaciers existed over those continents roughly 300 million years ago. North America, in contrast, was not covered in glaciers at that time. Wegener could not, with his technology at the time, explain fully how continental drift worked. Later, in 1929, Arthur Holmes suggested that the mantle underwent thermal convection. If you have ever seen a pot of water boil, you can see what convection looks like: heat causes the hot liquid to rise to the surface. Once at the surface, the liquid spreads, cools, and sinks back down. This is a good visualization of plate tectonics for kids and shows how convection of the mantle works. Holmes thought that thermal convection in the mantle caused heating and cooling patterns that could give rise to continents, and in turn break them down again. Decades later, research of the ocean floor revealed oceanic ridges, geomagnetic anomalies, massive ocean trenches, faults and island arcs that seemed to support Holmes’ ideas. Harry Hess and Robert Deitz then theorized that sea floor spreading was occurring, an extension of what Holmes had guessed. Sea floor spreading meant that the ocean floors spread out from the center and sank at the edges, and were regenerated. Dutch geodesist Felix Vening Meinesz found something quite interesting about the ocean: The Earth’s gravitational field was not as strong in the deepest parts of the sea. He therefore described this area of low density as being pulled down to the mantle by convection currents. The radioactivity in the mantle causes the heat that leads to the convection, and therefore the plate movement. What Are Tectonic Plates Made Of? Tectonic plates are broken pieces made of the Earth’s crust or lithosphere. Another name for them is crustal plates. Continental crust is less dense, and oceanic crust is denser. These rigid plates can move in different directions, shifting constantly. They make up the “puzzle pieces” of the Earth that fit together as landmasses. They are enormous, rocky and brittle parts of the Earth’s surface that move due to convection currents in the Earth’s mantle. The convection heat is generated by the radioactive elements uranium, potassium and thorium, deep in the tarlike, fluid mantle, in the asthenosphere. This is an area with incredible pressure and heat. The convection causes an upward push of mid-oceanic ridges and ocean floor, and you can see the heated mantle evidence in lava and geysers. As the magma upwells, it moves in opposite directions, and this pulls apart the sea floor. Then cracks appear, more magma emerges and new land is formed. The mid-oceanic ridges alone make up the Earth’s largest geological features. They run several thousands of miles long and connect ocean basins. 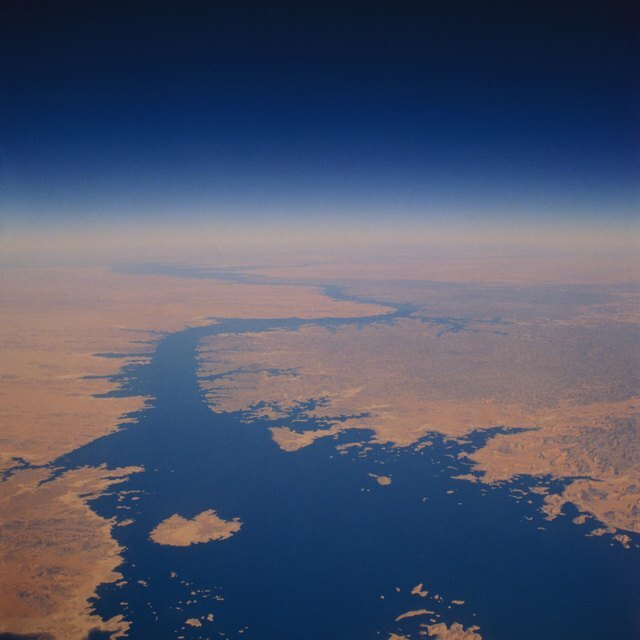 Scientists have recorded the gradual spreading of the sea floor in the Atlantic Ocean, the Gulf of California and the Red Sea. The slow spread of the sea floor continues, pushing tectonic plates apart. Eventually a ridge will move toward a continental plate and dive beneath it in what is called as subduction zone. This cycle repeats over millions of years. What Is a Plate Boundary? Plate boundaries are the boundaries of tectonic plates. As tectonic plates shift and move, they make mountain ranges and change the land near plate boundaries. 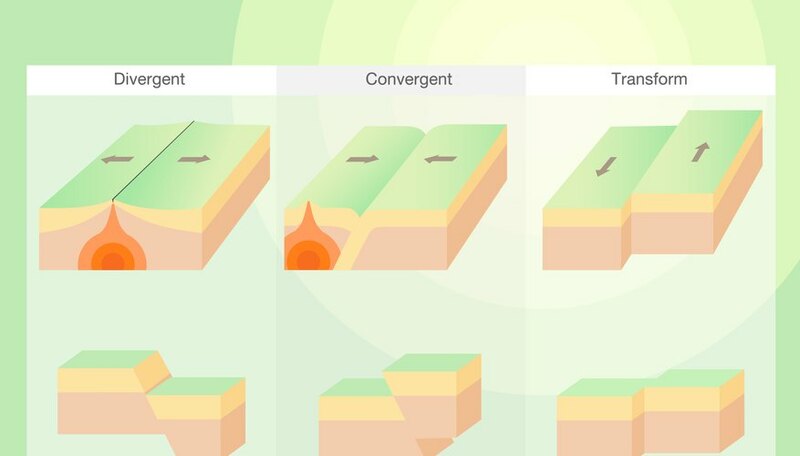 Three different types of plate boundaries help define tectonic plates further. Divergent plate boundaries describe the scenario in which two tectonic plates move apart from each other. These boundaries are often volatile, with lava eruptions and geysers along these rifts. Magma seeps upward and solidifies, making new crust on the plates’ edges. The magma becomes a kind of rock called basalt, which is found underneath the ocean floor; this is also called oceanic crust. Divergent plate boundaries are therefore a source of new crust. An example on land of a divergent plate boundary is the striking feature called the Great Rift Valley in Africa. In the distant future, the continent likely will split apart here. Scientists define tectonic plate boundaries that join together as convergent boundaries. You can see evidence of convergent boundaries in some mountain chains, particularly jagged ranges. They look that way because of the actual collision of tectonic plates, buckling the Earth. This is the manner in which the Himalayan Mountains formed; the Indian plate converged with the Eurasian plate. This was also how the much older Appalachian Mountains formed many millions of years ago. The Rocky Mountains in North America are a younger example of mountains formed at convergent boundaries. Volcanoes can often be found in convergent boundaries. In some instances, these colliding plates force oceanic crust down to the mantle. It will melt and rise again as magma through the plate it collided with. Granite is the kind of rock that forms from this collision. The third kind of plate boundary is called a transform plate boundary. This area occurs when two plates slide past each other. Often, there are fault lines underneath these boundaries; sometimes there may be ocean canyons. These kinds of plate boundaries do not have magma present. There is no new crust being created or broken down at transform plate boundaries. While transform plate boundaries do not yield new mountains or oceans, they are the site of occasional earthquakes. What Do Plates Do During an Earthquake? The tectonic plates boundaries are also sometimes called fault lines. Fault lines are infamous as the location of earthquakes and volcanoes. A great deal of geologic activity happens at these boundaries. At divergent plate boundaries, the plates move away from each other, and lava often is present. The area where these plates make a rift is susceptible to quakes. At convergent boundaries, earthquakes occur when the tectonic plates collide together, such as when subduction occurs and one landmass dives under another. Earthquakes also occur when tectonic plates slide alongside each other at transform plate boundaries. As the plates do this, they generate a great amount of tension and friction. This is the most common location for California’s earthquakes. These "strike-slip zones" can lead to shallow earthquakes, but they can also produce occasionally powerful earthquakes. The San Andreas Fault is a prime example of such a fault. The Hawaiian Islands are not part of the “Ring of Fire.” They are part of what is called a “hot spot,” where magma has risen from the mantle to the crust. The magma erupts as lava and makes dome-shaped shield volcanoes. The island of Hawaii itself is a huge shield volcano, much of which resides below the ocean surface. When you include the portion that is under the ocean's surface, this mountain is much taller than Mount Everest! Hot spots are home to earthquakes and eruptions, but eventually the tectonic plates they are on will move and any volcanoes will go extinct. The little islands called atolls are actually ancient volcanoes from hot spots that collapsed over time. While earthquakes are short-term and powerful events themselves, they are only part of a brief movement of tectonic plates over many millions of years. The long-term movement of whole continents is staggering to think about. Scientists know from the fossil record and from the magnetic stripes on rocks on the ocean floor that continents have moved, and the Earth’s magnetic field has reversed. In fact, the rock record shows that the magnetic field has switched multiple times, every few hundred thousand years. Dating these magnetic ocean floor rocks helps scientists understand how the ocean floors move over time. Many millions of years from now, the continents will likely look very different in location than they do today. The great certainty about the Earth is that it will continue to undergo change. Learning more about how plate tectonics work will only add to your understanding of this dynamic Earth. USGS: What on Earth Is Plate Tectonics? What Is the Primary Force That Causes the Seafloor to Spread? Dianne, J.. "Definition of Tectonic Plates for Kids." Sciencing, https://sciencing.com/definition-tectonic-plates-kids-8509085.html. 14 November 2018. What Forms in Divergent Boundaries? What Drives the Process of Plate Tectonics?